Andy Williams Folk Art Collection | Skinner Auction in Boston | Skinner Inc.
BOSTON, Mass. – February 14, 2013 – Skinner, Inc. will host an auction of American Furniture and Decorative Arts on Sunday, March 3rd in its Boston gallery. The auction features the Andy Williams Folk Art Collection and will also present the monumental silver punch bowl that F.W. Woolworth commissioned from Tiffany & Co. for architect Cass Gilbert, presented at the dedication of the Woolworth building in New York City in April 1913. A fine selection of Federal furnitureand a wide range of maritime art and artifacts will also be offered. The auction commences with The Andy Williams Folk Art Collection. Known the world over for his smooth voice and timeless charm, Andy Williams entertained generations through his music, television, and theater. Following an extraordinarily successful performing and recording career, Williams built a focused collection of visual art. 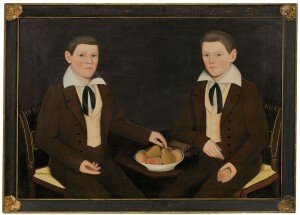 Alongside modern American paintings, American Indian artifacts, and pre-Columbian art, he put together a distinctly beautiful distillation of American folk art. Gathering prime examples of weathervanes, shop carvings, and paintings, Andy collected examples of uniquely distinctive and striking American popular and untrained art. He was known in the art world for his keen eye and impeccable taste, and his folk art collection supplies ample evidence of both. 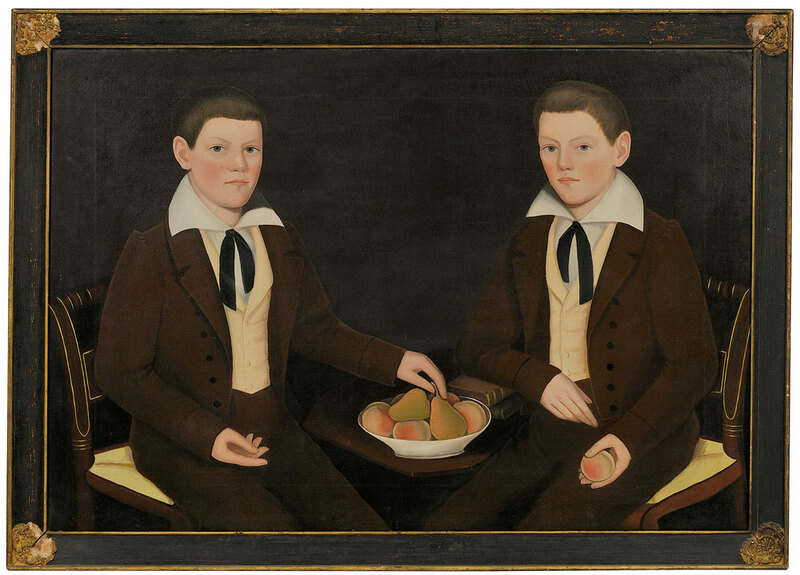 Notable paintings from the collection include two portraits by Ammi Phillips: a double portrait of the Ten Broeck twins (lot 13, estimated between $300,000 and $500,000) and a portrait of a child in a pink dress with a spaniel (lot 14, $200,000 to $300,000). One of John Rasmussen’s Berks County Almshouse paintings (lot 6, $100,000 to $150,000), James Bard’s portrait of the sidewheeler steamboat NEVERSINK (lot 7, $50,000 to $75,000), and an extraordinary and rare 19th century still life of a basket of fruit with flowers (lot 16, $150,000 to $250,000) round out this collection. The collection counts a number of decorative objects among its offerings, including a superb pair of Ward Brothers Widgeon decoys, carved in Maryland in the early 20th century, whose color and carving render them nearly life-like (lot 1, $20,000 to $30,000); and a carved and polychrome-painted race-track tout tobacconist figure (lot 8, $150,000 to $250,000). From late nineteenth century New England, this tout shows off the best of shop-figure carving and presents a confident stance, ready cigar, and flashy suit. Based on his stance, clothing, and carving style, it is possible that the polychrome tout is the work of figure carver Charles Parker Dowler. Weathervane lots include the J. Howard gilt cast zinc and molded copper “Index” Horse weathervane (lot 3, $15,000 to $25,000), a molded copper and cast zinc horse and sulky weathervane (lot 10, $15,000 to $25,000), and a gilt molded copper and cast zinc pig weathervane (lot 2, $15,000 to $25,000). A fine group of American silver spanning 300 years includes an important Tiffany & Co. presentation punch bowl, commissioned by F.W. Woolworth to commemorate the completion of the Woolworth building in Manhattan in April 1913 (lot 227, $30,000 to $50,000). 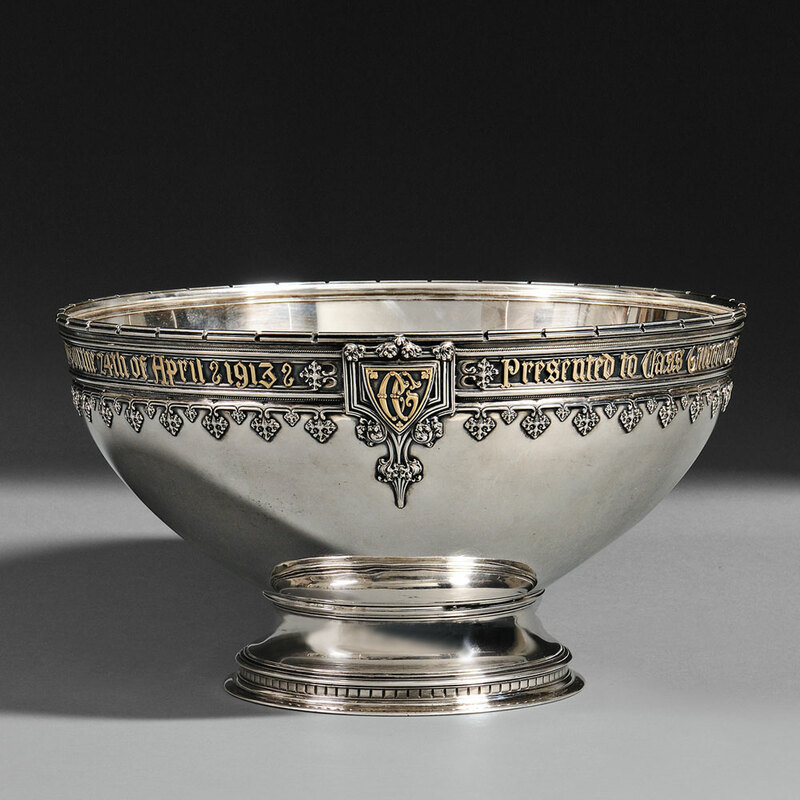 As the 100th anniversary of the Woolworth building nears, Skinner is pleased to offer the sterling silver punch bowl that F.W. Woolworth presented to the building’s architect, Cass Gilbert, during a legendary dinner that took place when the building first opened. 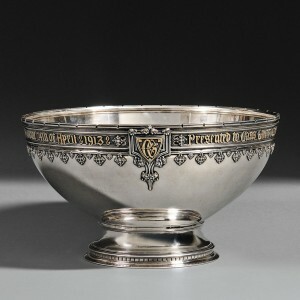 The bowl, which descended through the Gilbert family to its current owner, captures Gilbert’s architectural magnum opus by reproducing selected elements of the building’s neo-Gothic ornament for the bowl’s rim. These details combine with the clean, modern lines of the bowl’s silhouette and surface to create a magnificent effect. The interior of the bowl bears an engraving of the Woolworth building, transforming the image of monumental structure into a beautiful scale model that has the delicacy of a portrait miniature. A rare and very early silver tankard by Jacobus Van der Spiegel, New York City, c. 1700, (lot 215, $30,000 to $50,000) represents the work of one of New York’s first silversmiths.Similar tankards by this maker are in the collections at Yale University Art Gallery, Winterthur Museum, the Philadelphia Museum of Art, and the Metropolitan Museum of Art. An impressive selection of paintings includes a watercolor portrait miniature of a little girl with her cat and dog attributed to Boston miniaturist Clarissa (Peters) Russell (lot 254, $8,000 to $12,000) and a Chinese-school oil painting titled The Waterfront Hongs at Canton, China(lot 228, $15,000 to $25,000), an important record of the busy trade network between China and the West, including the ports of Boston and Salem. A 19th century American school painting titled The Junction formed in Medford by the Meeting of the [Mystic] River, Canal, and Railroad (lot 68,$20,000 to $30,000) will also be offered. In this painting, the artist draws together a remarkable confluence of the industrial and domestic and imbues them with great charm and enthusiasm. 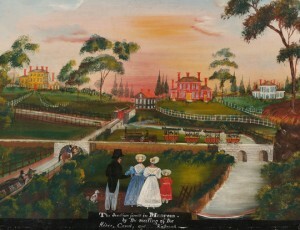 In overlapping the Medford transportation intersection with an anonymous set of observers and their homes, the artist achieves a delicately balanced rendering of the tension between the growing excitement of America’s Industrial Revolution and the enduring beauty of New England’s domestic landscape. Decorative objects of note include an American centennial carved walnut and pine box by John Bellamy (lot 91, $30,000 to $50,000). The box displays the Great Seal of the United States; the front carved with a spreadwing eagle grasping a banner inscribed “E PLURIBUS UNUM” over an American shield. Known by Americana enthusiasts everywhere as the “carver of eagles,” John Haley Bellamy made his living in the second half of the nineteenth century selling carvings of the American symbol to adorn ships and walls across New England. His body of work is composed almost completely of the iconic “eagle with banner” that appears with some frequency in well-known institutional and private collections. While this box is certainly a departure from his best-known productions, it is nonetheless an example of Bellamy at his best. A Civil War Pennsylvania 53rd Regiment pieced and gilt-stenciled silk American flag, circa 1864 (lot 164, $8,000 to $12,000) will be featured. Most likely a camp flag, this patriotic emblem bearing the mark, “53D. PA.” descended through the family of Captain Archibald F. Jones. Jones served for two and a half years in the 53rd Pennsylvania Volunteer Regiment, Company G, which recruited in Potter County, mustered in October 29, 1861. He was discharged on July 24, 1864. According to the family, Captain Jones received the flag from the regiment, who mailed it to him from the Appomattox Post Office within days of General Robert E. Lee’s surrender. Previews for the auction will be held on Thursday, February 28, 2013, 12 p.m.-5 p.m., and Friday, March 1, 2013, 12 p.m.-8 p.m., and Saturday, March 2, 2013, 12 p.m.-5 p.m. Illustrated catalog #2640B is available by mail from the subscription department at #508-970-3240. It is also available at the gallery. Prices realized will be available at www.skinnerinc.com during and after the sale. Skinner’s site also allows users to view all lots in the auctions, leave bids, order catalogs, and bid live in real-time through SkinnerLive! Like us on Facebook at http://www.facebook.com/skinnerauctions. This entry was posted in News and tagged american antiques, American furniture, american painting, Andy Williams, boston auction, decorative arts, folk art, folk art painting, marine art, maritime art, paintings, weathervane by Skinner. Bookmark the permalink.